The root and rhizoma of Sophora tonkinensis Gapnep. of family Leguminosae. Mainly in Guangxi, Guangdong, Jiangxi, Guizhou provinces of China. Collected at anytime, but mainly dug out in autumn. It is also called Guang Dou Gen.
Bean-like smell, extremely bitter taste. Thick and big rhizome, hard quality without fibrous root. Bitter, cold; toxic; lung and stomach meridians entered. Clear heat and remove toxicity, alleviate sore throat and relieve swelling. 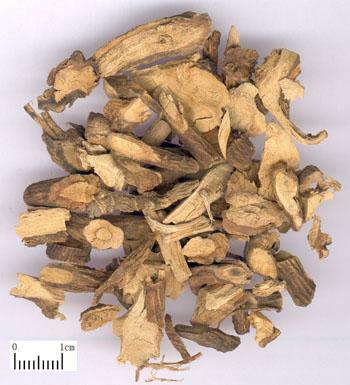 With the much stronger properties of bitter cold, it excels in clearing heat and removing toxicity to further alleviate sore throat and relieve swelling and pain. Being regarded as an essential herb for treating heat-toxicity accumulation, and swollen and sore throat, it can be used singly as gargle or in decoction, or slow swallowed with vinegar. For excessive heat-toxicity, it should be combined with herbs for clearing heat-toxicity from lung and stomach such as Sheng Ma and Da Huang, etc. , as in Shan Dou Gen Wan from Ren Zhai Zhi Zhi Fang. For fettering exterior by wind-heat accompanied, it can be combined with wind-heat-dispersing herbs, for example in Qing Liang San from Wan Bing Hui Chun, Lian Qiao are used in combination. For yin deficiency with effulgent fire accompanied, it can be combined with yin-nourishing and fire-reducing herbs such as Xuan Shen, Mai Dong, etc. , as in Shan Dou Gen Tang from Ci You Xin Shu (A New Book of Benevolent Pediatrics). With the actions of clearing heat and removing toxicity, relieving swelling and dissipating nodulation, it is also indicated for syndrome of excessive heat-toxicity manifested as swollen and painful gum, hemorrhoid with swollen pain, sores and abscess, and venomous insect stings. It can be decocted singly for topical soaking and washing, or pounded for topical smearing with juice, or combined with corresponding heat-clearing herbs for oral administration according to syndrome differentiation. In addition, for it has certain actions of clearing lung-heat and eliminating damp-heat, it can also be used in treating cough due to lung-heat and jaundice due to damp-heat. Decoct 3～6 g. Proper dosage is for topical application. It is extremely bitter and cold, and poisonous; overdosage should be avoided since that may easily cause nausea, vomiting, dizziness, headache, diarrhea, and abdominal pain, weakness of four extremities, palpitation, and oppression in chest, even deadly cold hands and feet, spasm, and so on.